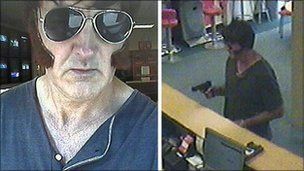 An armed robber wearing an Elvis Presley-style disguise has held up a second betting shop in Brighton and Hove in four days. The man wearing fake sideburns and carrying a handgun stole between £400 and £500 from Ladbroke's bookmaker's in Dyke Road, Brighton, at about 1000 BST. On 7 July a man wearing a false beard held up the William Hill betting shop in George Street, Hove, with what police believe was a black handgun. The Ladbroke's raider is about 6ft tall, with dark hair, and was wearing dark sunglasses and dark clothing as well as the false sideburns. He escaped with the cash and headed south along Dyke Road. No-one was hurt in either robbery.